I have been dealing with autographs for many years and guarantee ALL of my items to be 100% genuine. You will not be disappointed with my product or service. 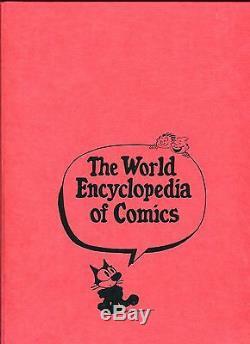 With that being said this is a FANTASTIC AND RARE HAND SIGNED HARDCOVER COPY OF THE WORLD ENCYCLOPEDIA OF COMICS, VOLUME 5. 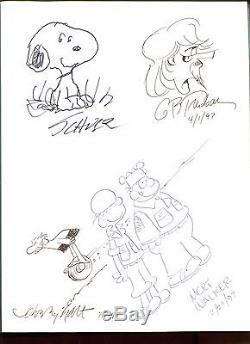 ON THE FIRST PAGE (OPPOSITE THE INSIDE COVER) ARE ORIGINAL SIGNED DRAWINGS FROM CHARLES SCHULZ (PEANUTS), MORT WALKER (BEETE BAILEY), JOHNNY HART (BC), and GARRY TRUDEAU (DOONESBURY). WALKER HAS ACTUALLY DRAWN BEETLE AND SARGE FROM BEETLE BAILEY. THIS IS A TRUE ONE OF A KIND BOOK THAT WOULD BE THE ULTIMATE ADDITION TO ANY CARTOON ART COLLECTION. BOOK WILL COME WITH A FULL LETTER FROM JSA (Y41475). JSA LETTERS ARE VERY EXPENSIVE AND AS GOOD AS IT GETS WHEN IT COMES TO AUTHENTICATING AN ITEM. The actual item is much nicer in person. 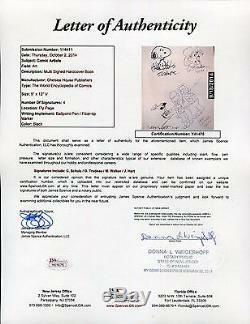 Come with a full letter from JSA guaranteeing the signatures/artwork to be 100% authentic. I stand behind every autographed item I sell-FOREVER! Thank you for taking the time to look at this item and please check out my other items for sale. Hope to do business together soon. The item "CHARLES SCHULZ+GARRY TRUDEAU+WALKER+JOHNNY HART ORIGINAL ART IN BOOK JSA LETTER" is in sale since Wednesday, October 08, 2014. This item is in the category "Collectibles\Comics\Original Comic Art\Comic Strip Art". The seller is "autographseller69" and is located in New York. This item can be shipped to United States.